The 12th Festival du Film Coréen à Paris (FFCP) came to a close with a screening of director HUH Jung’s horror film, The Mimic. “We had 14,000 festival attendees this year, which is the most we’ve had so far.” a festival executive reported. In addition, it was announced that UM Tae-hwa’s fantasy drama VANISHING TIME: A BOY WHO RETURNED won the festival’s Audience Award. 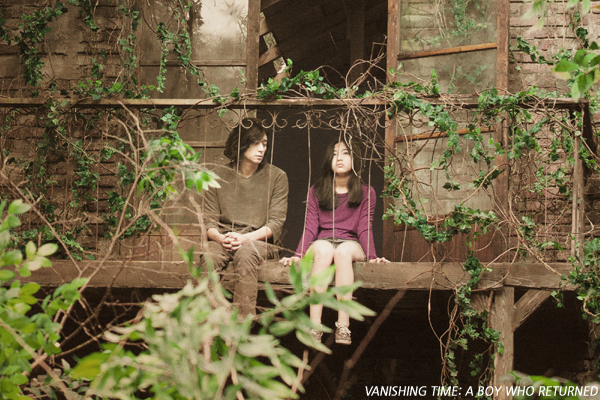 VANISHING TIME: A BOY WHO RETURNED is a fantasy melodrama that stars GANG Dong-won, SIN Eun-su, and LEE Hyo-je. In the film, a young boy named Sung-min (GANG) vanishes in the forest and returns as an adult a few days later. The only person who believes his story is a young girl named Su-rin (SHIN). The film has already screened at several international film festivals including the 19th Udine Far East Film Festival, the 16th New York Asian Film Festival and finally the 35th Brussels International Fantastic Film Festival were the film was screened in competition and received special recognition. For this year’s edition of FFCP, the film was invited as a part of the main section called “Paysage”. Other films that received awards include BAE Kyung-heon’s Alone Together which won the Prix FlyAsiana Award in the “Shortcuts” shorts competition section, KIM Ji-hyeon‘s Throttled which was given the Kia Award for Best Short Animated Film and KIM Kyung-joo’s Starting School which received the Kumho Tire Scenario Award as well as this year’s newly established short film award that was decided by a student jury. ZHANG Lu’s A Quiet Dream received a special mention from the audience jury, with Jero YUN’s Hitchhiker also getting an honorable mention from the jury.